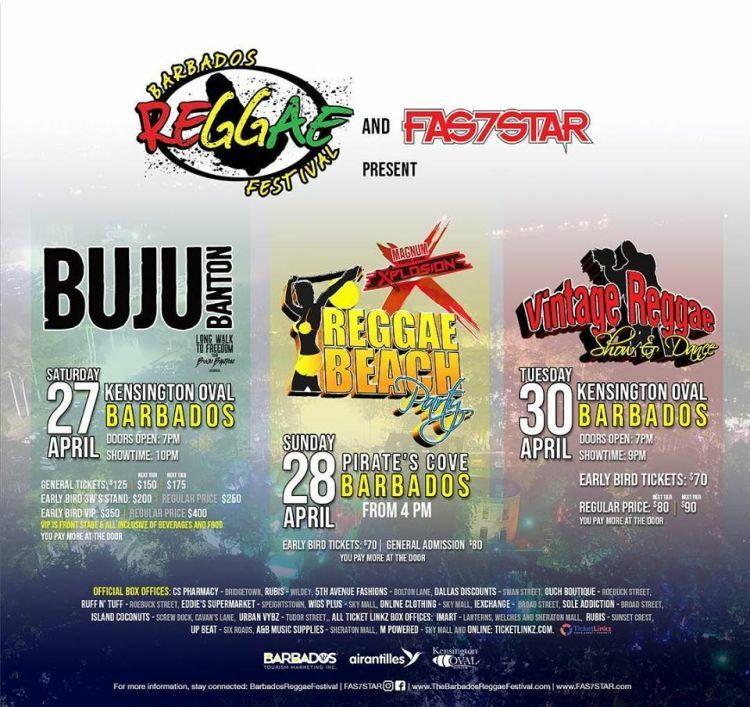 Here's the schedule for this year's Barbados Reggae Festival. 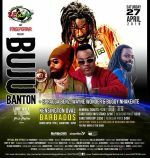 Performers include: Spragga Benz, Wayne Wonder and Buggy Nhakente. 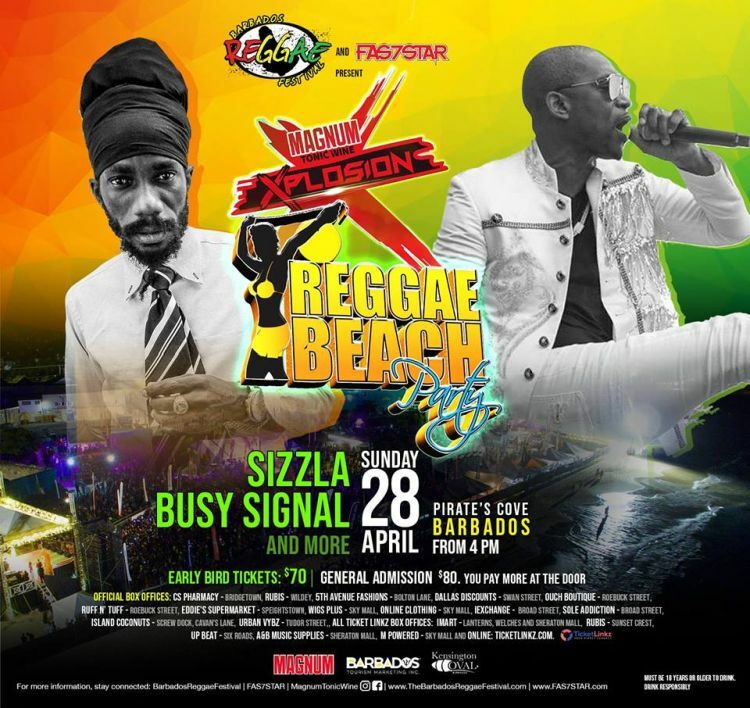 Performers: Sizzla, Busy Signal, Stiffy, Marzville, Jus D, Holla Bak. 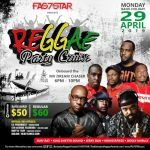 DJs: Surf Rat, Kig Ghetto Sound, Jerry Dan, Monstapiece and Dooly Unruly. 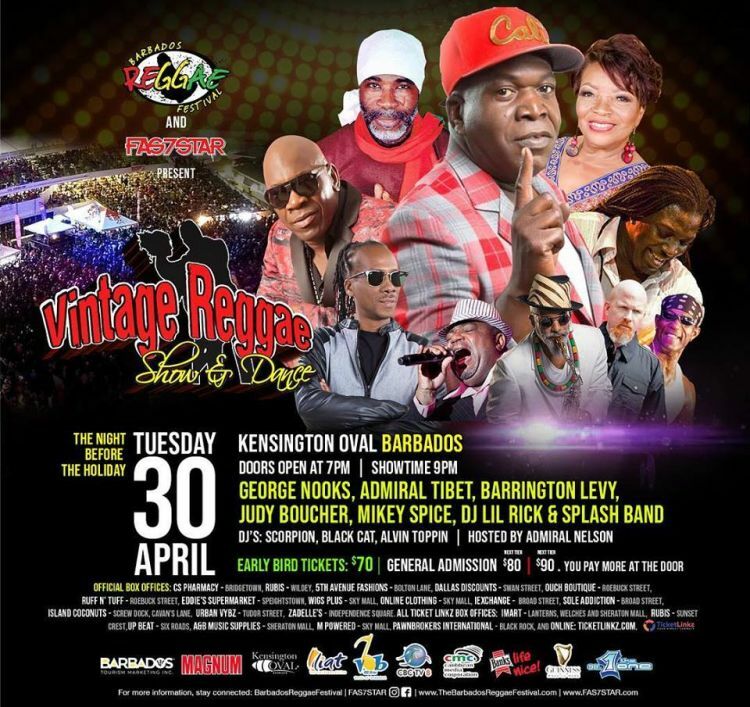 Performers: George Nooks, Admiral Tibet, Barrington Levy, Judy Boucher, Mikey Spice, DJ Lil Rick and Splash Band. 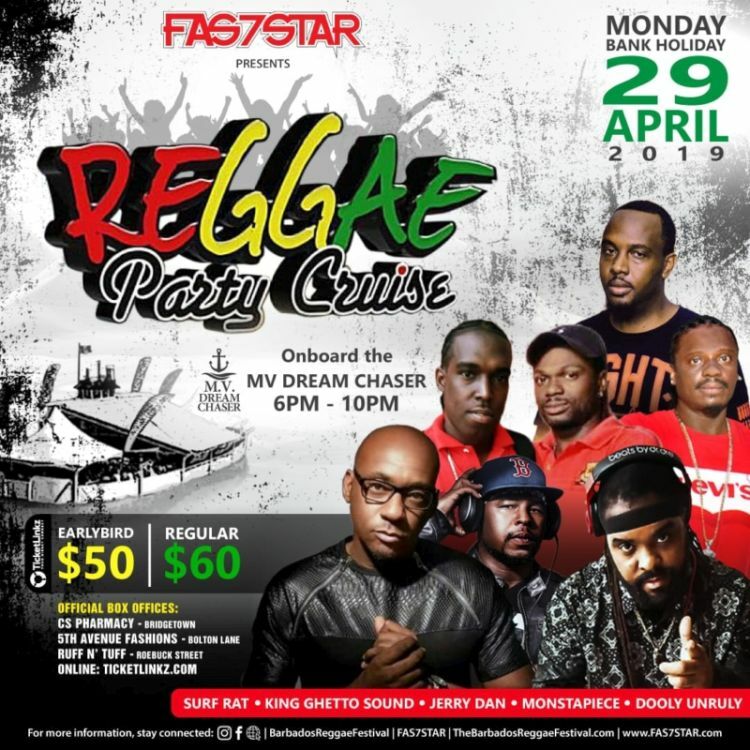 Pay more at the door. General Tickets: Bds $80 | $90 while stocks last. 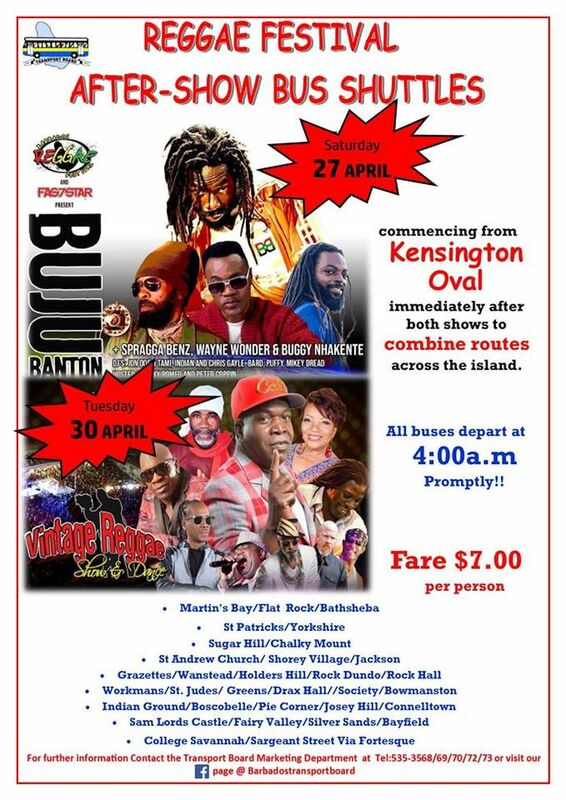 See 2nd attached flyer for After-Show Bus Schedules. 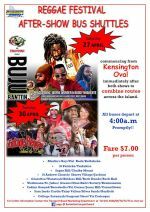 CS Pharmacy, Bridgetown; Rubis, Wildey; 5th Avenue Fashions, Bolton Lane; Dallas Discounts, Swan Street; Ouch Boutique, Roebuck Street; Ruff N’ Tuff, Roebuck Street; Eddie's Supermarket, Speightstown; Wigs Plus, Sky Mall; Online Clothing, Sky Mall; iExchange, Broad Street; Sole Addiction, Broad Street; Island Coconuts, Screw Dock, Cavan's Lane; Urban Vybz, Tudor Street; iMart, Lanterns Mall, Welches and Sheraton Mall, Rubis, Sunset Crest; Up Beat, Six Roads; A&B Music Supplies, Sheraton Mall; M Powered, Sky Mall; Online: https://ticketlinkz.com .